Without the countless hours spent in the backyard, on the playground, or the streets, there would be no Larry Legend, MJ, or Magic. You don't get to the bright lights by accident. It's what you do when nobody is watching. You don't get to the bright lights by accident; it's what you do and how you shoot when nobody is watching. These are the basketball hoops of America. Last light of the day illuminates a basketball hoop hanging on a barn in Illinois. A backboardless rim hangs on a metal-pole barn in Kansas. A wood backboard and rim seem to almost blend into the old barn they hang on in Utah. Rotting deer heads take over an old hoop in Idaho. A basketball hoops hangs on a telephone pole in front of an old church in a small Colorado town. A basketball hoop is reflected in a rain puddle in San Diego. A hoop made from a milkcrate and plywood hangs near a shuttered, Gothic church in upstate New York. Manhattan is the backdrop for this court in the cross-river city of Jersey City, New Jersey. A wood backboard hangs on a shingled barn in Nebraska. No court needed in South Dakota. Locals play on grass, or at least they used to. Fall sunset illuminates a small-town scene in New Mexico. A resilient hoop still remains in this decaying high school gym in Kansas City that has been boarded up for some time. A tire swing and basketball hoop are seen on a stormy day at a Missouri farm house. A basketball hoop hangs on an old sheet-metal barn in Nebraska. A basketball court is seen at night in front of the massive Morro Rock on the coast of central California. Years ago, the American flag was painted on the walls of this old gym on the outskirts of Indianapolis. 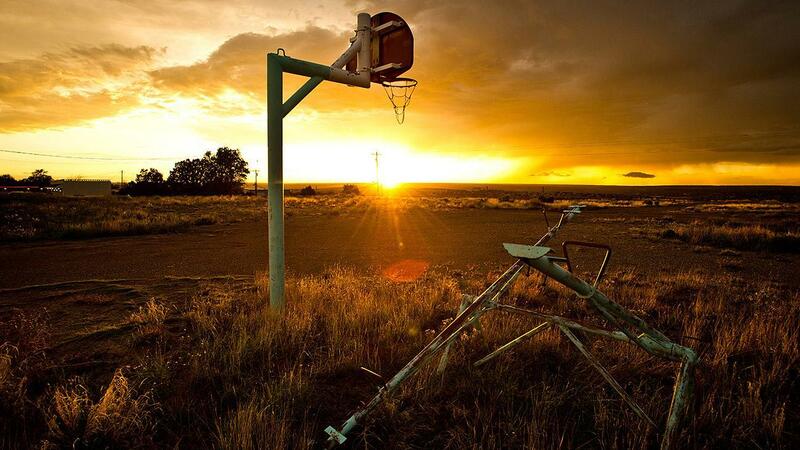 The sun sets on an abandoned New Mexico seesaw and basketball court that have been overtaken with weeds. A basketball hoop made from plywood and a bicycle rim is seen in the California desert. On Indian Reservations in Arizona, basketball is played everywhere, as seen here on an expansive wash of red clay. A sunny day in Idaho wheat fields reveal a bird resting on a broken-down, metal basketball hoop.